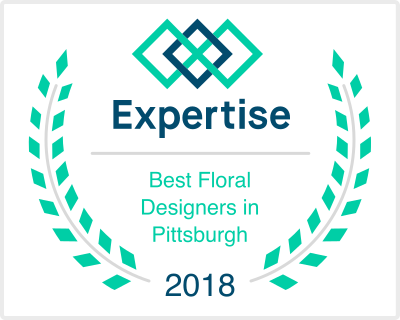 Expertise.com, which uncovers the top local businesses in a number of U.S. cities to help its readers hire the best, has again named All Occasion Silk Creations among the top 19 floral designers in Pittsburgh. The Imperial-based silk and Real Touch florist was selected out of 88 floral designers serving the Pittsburgh area based on five categories that included 25 variables. These initial 88 floral designers were curated down to 60 before the best 19 were hand-picked by the company. Contenders were evaluated and chosen based on Expertise.com’s selection criteria that included reputation, credibility, experience, availability, and professionalism. All Occasion Silk Creations is the only florist among this year’s top picks that works strictly with silk and Real Touch flowers. We are excited to add this accolade to our growing list of awards and recognition, and thank our amazing couples for trusting us to continue providing them with the best service and flowers in Pittsburgh! We’ve built our business on mastery of our craft, exceptional customer service, responsiveness, and a deep-rooted combination of reliability, respect, and honesty; we thank you for helping us maintain this spot as an industry leader in silk and Real Touch flowers. Are you ready to work with one of the best floral designers in Pittsburgh? Click here to submit your pre-consultation form or give us a call at (724) 695-2259. Previous ArticleQ&A: What is a Real Touch Flower?